Explanation: Scanning the skies for galaxies, Canadian astronomer Paul Hickson and colleagues identified some 100 compact groups of galaxies, now appropriately called Hickson Compact Groups. 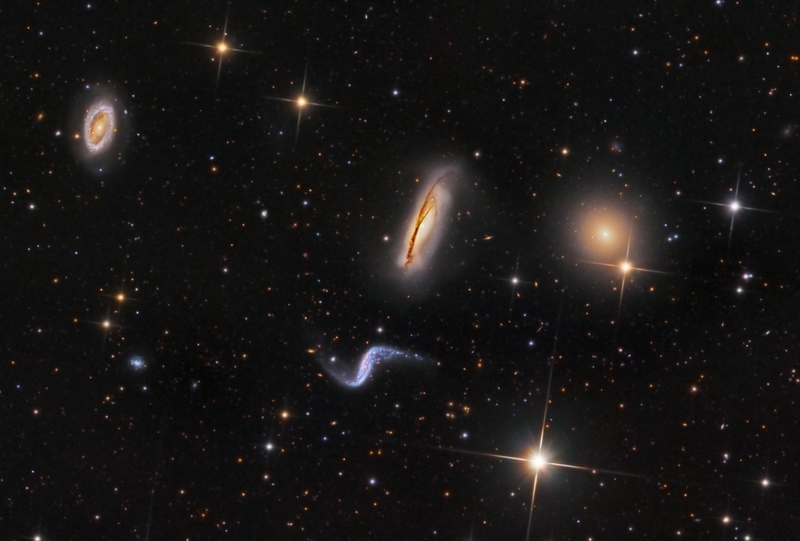 The four prominent galaxies seen in this intriguing telescopic skyscape are one such group, Hickson 44, about 100 million light-years distant toward the constellation Leo. The two spiral galaxies in the center of the image are edge-on NGC 3190 with its distinctive, warped dust lanes, and S-shaped NGC 3187. Along with the bright elliptical, NGC 3193 at the right, they are also known as Arp 316. The spiral in the upper left corner is NGC 3185, the 4th member of the Hickson group. Like other galaxies in Hickson groups, these show signs of distortion and enhanced star formation, evidence of a gravitational tug of war that will eventually result in galaxy mergers on a cosmic timescale. The merger process is now understood to be a normal part of the evolution of galaxies, including our own Milky Way. For scale, NGC 3190 is about 75,000 light-years across at the estimated distance of Hickson 44.